(a) What is the efficiency of a cyclical heat engine in which 75.0 kJ of heat transfer occurs to the environment for every 95.0 kJ of heat transfer into the engine? (b) How much work does it produce for 100 kJ of heat transfer into the engine? This is College Physics Answers with Shaun Dychko. The efficiency for a cyclical engine can be expressed as one minus the amount of heat lost to the environment divided by the amount of heat absorbed from the hot temperature reservoir. So it’s 1 minus 75 times 10 of 3 Joules divided by 95 times tenth of three joules which is an efficiency of 0.211. 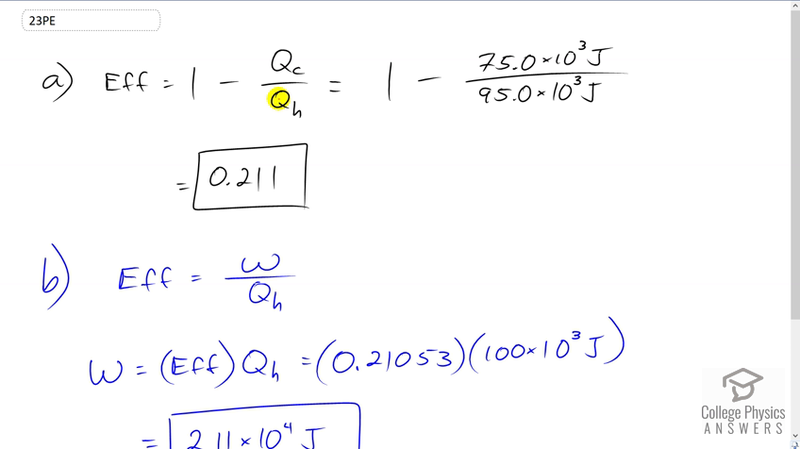 Now efficiency can also be written as the work done by the engine divided by the energy it absorbs and we’ll solve this for W by multiply both sides by Qh and so the work done is the efficiency times the energy absorbed and the efficiency we calculated already in part A but writing it with more digits is 0.21053 times 100 times tenth to the three Joules gives us 2.11 times tenth to the four joules of work done.